Gallery of emotions for principles of make-up correction. If there is no confidence in correctness of chosen physiognomic symbols and stylistic principles for correction of emotions then it is better if cosmetic make-up of a female face will follow existing natural emotional image of a woman. Facial features and meanings of emotions. Joyful eyebrows - happy ideas. Quiet eyes - absence of desires. Sad mouth - mournful feelings. Joyful eyebrows and quiet eyes seem sorrowful as the mouth expresses sad emotions. The sad mouth and joyful eyebrows seem calm as eyes express quiet emotions. Quiet eyes and sad mouth can seem glad as eyebrows express joyful emotions. Happy ideas realize sad feelings, but the person does not see or notice own thoughts and sensations. Joyful ideas surpass sad feelings, but the person refuses desires and consequently sad gloomy sensations deny glad ideas. 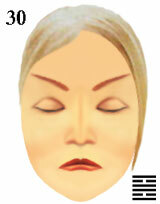 cosmetic principles for make-up correction of a face.